Mark Werner is currently a Co-Director of the Parish Bi-Monthly Blood Drives and works effectively to make every drive a successful event. 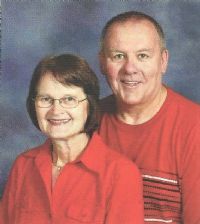 Mark and his wife Betty are both regular blood donors. Mark continues to serve as a weekly volunteer in support of the St Francis Xavier House of Bread Food Pantry. He is a contributing member of the Parish Building and Grounds committee and participates in all Parish workday events. He is a valuable and reliable brother Knight who volunteers his time and talents for all Council meetings and participates in all Council service and social events. Mark and Betty have contributed significant effort in service to this Council and our Parish community. Betty is a loyal member of the Ladies Altar Society Parish Funeral Luncheon Committee contributing many volunteer hours of funeral luncheon service to the families of deceased parishioners. Betty also provided much needed help to this Council during the 2018 Wing Ding by serving as the judge coordinator of the children’s dance contest. 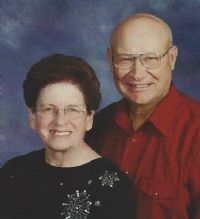 We extend our congratulations to the Mark and Betty Werner family on being awarded the Council Family of the Month for January 2019. Bradley Carr is currently the elected Council Warden and serves as a member of the council’s Admissions Degree team. He is a valuable and reliable brother Knight who volunteers his time and talents for all Council meetings and participates in all Council service and social events. He is a reliable service member of the council fry cook team. Bradley along with his wife Milley have contributed significant efforts in service to this Council and our Parish. Together Brad and Milley continue to serve Saint Francis Xavier Parish as coordinating leaders of the volunteer team that provides and prepares monthly meals to the Saint Joseph Community Open Door Food Kitchen, an outreach program providing critically needed meals to underprivileged and hungry persons of our community. Brad’s father William, and their son Spencer, are also members of our St Francis Xavier Knights of Columbus Council. We extend congratulations to the Brad and Milley Carr family on being awarded the Council Knight Family of the Month award for October 2018. Doug Glidewell is a valuable and reliable brother Knight who volunteers his time and talents for all Council projects and charitable service events. He performed commendable service as a fry team cook on a very hot day in June during our recent Parish chicken dinner event. Doug completed the 4th Degree of Knighthood in April and volunteers as a Hospitality Minister for weekend parish Masses. Doug is also completing a three-year term this year as a member of the St Francis Xavier Parish Council. He and his wife Nicole are members of the St Francis Xavier Parish Youth Ministry Team that most recently coordinated and organized the presentation of the Confirmation program to 32 of our finest youth as they completed their sacrament of Confirmation this past May. 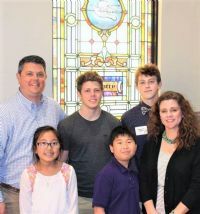 They were joined on an equal basis in this volunteer religious instructional activity by their daughter Marisa, thus making it a complete family unit volunteering to serve our Parish as lay leaders. This award is presented to the Family of Doug and Nicole Glidewell who serve as an inspiration to our Parish and Council by supporting and strengthening Christian family life. Congratulations Doug, Nicole and Marisa Glidewell on being awarded Council 15126 Knight Family of the Month for June 2018. Gordon Carmichael is the Financial Secretary of our council and is a Past Grand Knight. He is a valuable and reliable brother Knight who volunteers his time and talents for all of our Council events. He directs the council’s annual Food for Families program which has received award recognition from Supreme Council for the past three years. Gordon regularly volunteers his personal time for the mission of the SFX House of Bread food pantry. His wife Mag is a long-time active member of the St Francis Xavier Parish Altar Society and recently made and donated a personally handcrafted patchwork quilt for use as a year-end incentive award for individuals who donate blood to the St Francis Xavier Knights Quarterly Blood Drives. 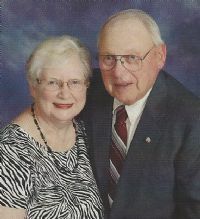 Mag and Gordon recently celebrated their 50th wedding anniversary. Gordon is an active member of the Fourth Degree St Joseph General Assembly 569 serving as their Faithful Controller and is a member of the Honor Guard. He has also served as the event chair from Council 15126 to coordinate the Assembly 569 annual covered dish dinner meeting in our Parish Center during month of February. Larry Bahr is the Church Service Director of our council. He has coordinated and led the Knight sponsored monthly Rosary services for the parish. He personally trains and coordinates the youth servers for our parish Masses and conducted the most recent training session during the month of January. Larry supervises many of the kitchen cooking activities for our council events including the enchilada preparation sessions and our fryer cooking team for council dinners. He is an active supporter of council projects including the St Joseph Walk for Life, St Joseph Youth Alliance and Faith In Action. Paula, his wife, is a ministry group leader and an active participant with the Parish Celebration Choir which provides music for the 4 PM Saturday parish Masses. 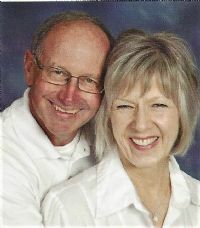 Larry and Paula are a long-time Lead Couple within our parish for Engaged Couple Marriage Preparation. Larry and Paula have both volunteered their time and talents as active team leaders for the Open Door Food Kitchen - a parish outreach program which provides critically needed meals to the underprivileged and hungry members of our St Joseph community. They are both reliable and frequent supporters of all of our council work and social activities. Roger Rohrer has been our Council Treasurer for multiple terms. He coordinated the use of the electronic debit/credit card reader scanning device for use in collecting fees for Council events and collection of payments. He originally set up and now monitors the Council Endowment fund For Education. He is a Mass Lector for the Parish. He is an active member of the 4th Degree General Assembly 569. Along with his wife Renee, they have co-chaired the Christmas Giving Tree program in the Parish during the month of December for multiple years. They both have participated in the St Joseph Walk for Life event. They both participate in all council social and volunteer events. Bill Eddins is a valuable and reliable brother Knight who volunteers his time and talents for most all of our Council events. 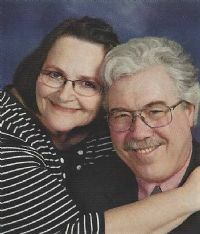 He and his wife Gail are both members of the St Francis Xavier Parish Adult Faith Formation Team that initially coordinated and organized the presentation of the Discovering Christ series, the Following Christ series and then the Sharing Christ series within our parish. They also helped to organize, facilitate and then participate in the parish Koinonia Retreat last year. 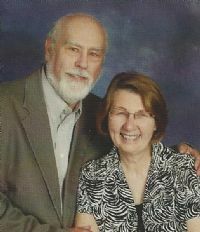 They both volunteered their efforts as lay leaders in each of these series, serving as worship leaders and table leaders. 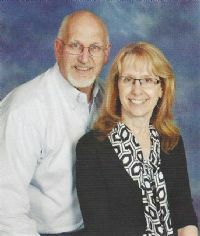 Bill and Gail both serve as Hospitality Ministers for weekend parish Masses. Gail recently completed a three year term as a member of the SFX Parish Council and served as the immediate Past President. Gail was the founding organizer and coordinator of the St Francis Xavier Parish Women’s Tea held for the past two years during the month of November. John Bitunjac is Head of the parish Building and Grounds Committee. He holds the office of Council Advocate and participates in all council events (Faith in Action, Walk for Life, Tootsie Roll drive, parish dinners etc.). He recently donated a personally handcrafted cedar-lined bed chest for use as the prize in a K of C raffle during our Lenten dinners. He is Youth Services Director (coordinator of the BB, essay, and alcohol & drug awareness poster contests). He is a Mass Server and a Eucharistic Minister. He is a member of Assembly 569 and a 4th Degree Honor Guard member. His wife Nyla is the Parish School of Religion Coordinator and is a team member of the KC-St Joseph Diocese MAX prison/jail ministry team. She received a 2016 Mother Theresa Award from St Joseph Catholic Charities. As a couple they were both selected as representatives to attend the KC-St Joseph Diocese awards ceremony held in October – as Parish Volunteers of the Year. 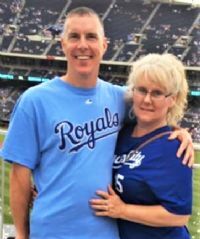 They both serve as SFX Elementary School substitute teachers, Discover Christ Series team/table leaders, as a Marriage Preparation - Lead Couple, and have organized and chaperoned parish youth field trips for the mass servers. Leo and Shirley Hoefer exhibit the values desired in the Knight Family of the Month award by showing exemplary status in our community. Leo is a PGK and is currently the 3-Year Trustee and Service Committee Membership Director. Leo attends mass daily and serves one week a month and any other times they need help. He is also a Eucharistic Minister who can be found every Tues. and Thurs. morning volunteering to work at the SFX House of Bread food pantry. He recently provided some personal carpentry services within the pantry by constructing a needed safety railing to accommodate access for elderly clients. Leo is currently serving as a Discovering Christ Series table leader for the parish while Shirley coordinates the food preparation and serving of meals for the series participants. Leo frequently volunteers time as a 4th Degree Honor Guard member to appear at numerous community and church related events. Both Leo and Shirley readily volunteer to provide support for all of our council events. Shirley is a versatile, dedicated and reliable worker and most recently took council photos for the Parish’s 125th Anniversary Mass and Dinner. Leo and Shirley have both provided dedicated service to the SFX Parish Sunrise Fellowship Breakfast committee and are known as people who will help you any way they can. Although their children are all grown, they are now frequent baby setters for their grandchildren. 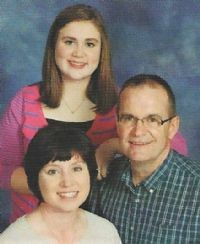 The Scott and Stephanie Hudson family exemplifies many of the values that the Knights Of Columbus extols as their goals. Scott is one of the newest Knights in our council but has contributed much since being initiated. He is an appointed member of the Recruitment Committee, he coordinates our new council Facebook page and he is already an integral member of our kitchen crew for council dinners. Scott is a community leader, serving on committees for the St Joseph Chamber of Commerce, serving as the Office Manager for Reece Nichols-Ide Capital Realty Inc. Scott is President of the 2016 LeBlond High School Boosters Club, he developed the initial SFX Elementary School Facebook page and he served as a volunteer Catholic Youth Chaperone for the bus trip to the 2016 March For Life in Washington, DC. Scott's wife of 20 years Stephanie is the 2016 LeBlond High School Booster Club Vice President for Special Events and together they have coordinated four August events: 1) Kick-Off Dinner Aug 13th at SFX Parish Center, 2) LB Carnival Booster Club Food Booth, 3) LB Booster Club Football Tailgate Party Aug 26th, 4) LB Booster Club Beer Tent at the Rosecrans Air Show Aug 27-28th. Scott's two oldest children (Kalvin and Benjamin) play varsity football at LeBlond and his two youngest (Katrina and Lucas) attend St Francis Xavier Elementary School. Scott and Stephanie are integrally involved in all aspects of their children's very active lives as well as with the Knights of Columbus.